Sun on the Bog; Nice Light on Bord na Mona—February 2018. The Irish Midlands are famously cloudy. However, when the evening sun shines it makes for some wonderful photographic opportunities. 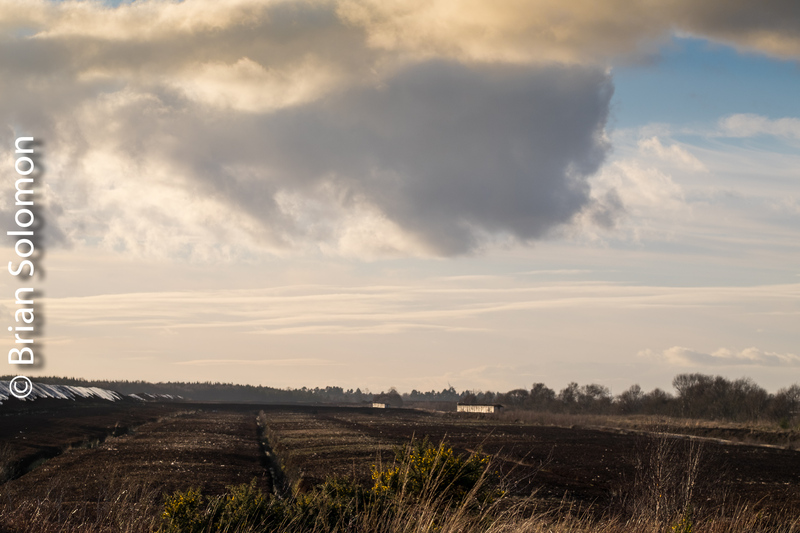 In February, Denis McCabe and I waited out the clouds, and caught two pairs of laden Bord na Mona trains in bright sun. These images were exposed near Rathangan, Co. Kildare. More Adventures with Ireland’s Bord na Mona—September 2013. Last week, Mark Healy and I made a foray into Irish bog lands searching for narrow gauge peat trains operated by Bord na Móna (Peat Board). We’d been watching the weather closely and tried to time our visit for a bright clear day. We got it wrong. Despite a rosy sunrise in Dublin and generally good forecast, we faced fog, cloudy and just general overcast in County Offaly. After more than a half dozen visits to this rarely photographed industrial railway, I thought I was beginning to have an understanding of their operations. I got that wrong too! While, we’d photographed a dozen trains by the end of the day, actual operations were quite different than what I expected. Trailing view of Bord na Móna’s Shannonbridge empty ash train returning to Shannonbridge, County Offaly, Ireland. Canon EOS 7D photo. 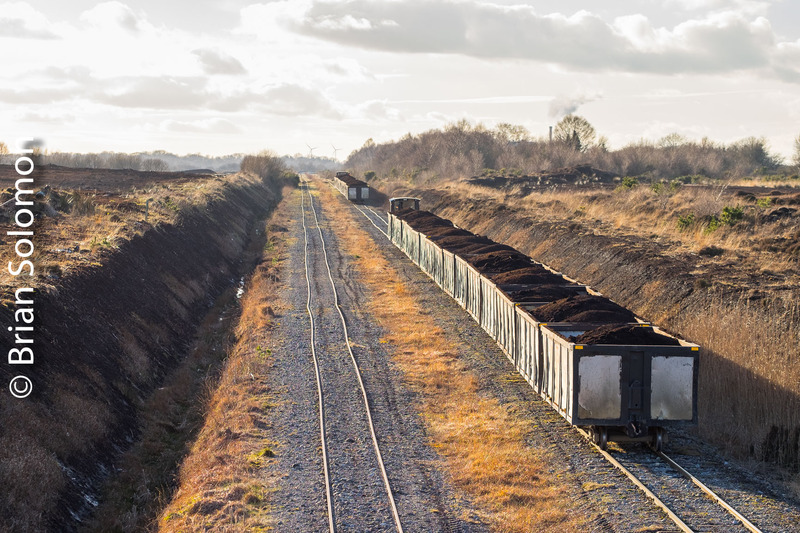 Laden peat train near Shannonbridge, September 2013. Exposed with a Lumix LX3. Laden trains approach Shannonbridge. Canon EOS 7D photo with f2.8 200mm lens. Initially we worked the lines radiating out from Shannonbridge. Our first train was the ever-elusive ash train. That was a bonus for us. After about five hours, having photographed several loaded and empty trains, we decided to head east toward Edenderry, which is the focus of another of Bord na Móna’s networks. My error was corrected when we chatted to one of the drivers. Turns out these were empty trains heading out loading to bring peat to the Derrinlough briquette factory. Just dumb luck to catch this operation. Closing the level crossing gates on Ireland’s R357 east of Cloghan, County Offaly. Canon EOS 7D 7D photo with f2.8 200mm lens. A Derrinlough-based Bord na Móna train near Cloghan, County Offaly. Canon EOS 7D 7D photo with f2.8 200mm lens. A Derrinlough-based Bord na Móna train crosses highway R357 near Cloghan, County Offaly. Lumix LX3 photo. Trailing view of Derrinlough-based Bord na Móna trains near Cloghan, County Offaly. Canon EOS 7D 7D photo with f2.8 200mm lens. We finished the day inspecting operations near Mt Lucas and Edenderry. Pity about the lack of sun. I’ve dealt with Bord na Móna several times in previous posts. Gallery 8: Irish Bog Railways—Part 1; Irish Bog Railways—Part 2 February 16, 2013; Irish Bog Railways—Part 3, March 2, 2013; Irish Bog Railways—Part 4, August, 2013; and Bord na Mona’s Ash Train. Tracking the Light posts new material daily. Please spread the word and share Tracking the Light with anyone who may enjoy seeing it! 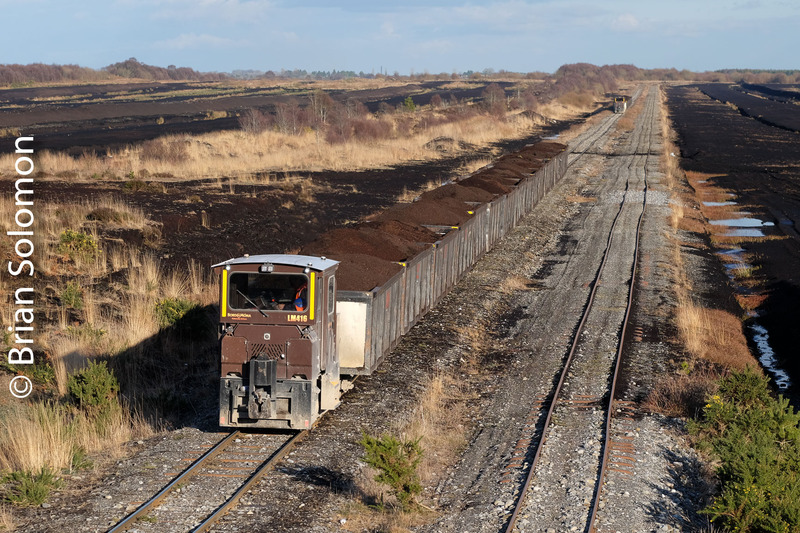 Bord na Mona’s laden ash train works east from the West Offaly power station at Shannonbridge. 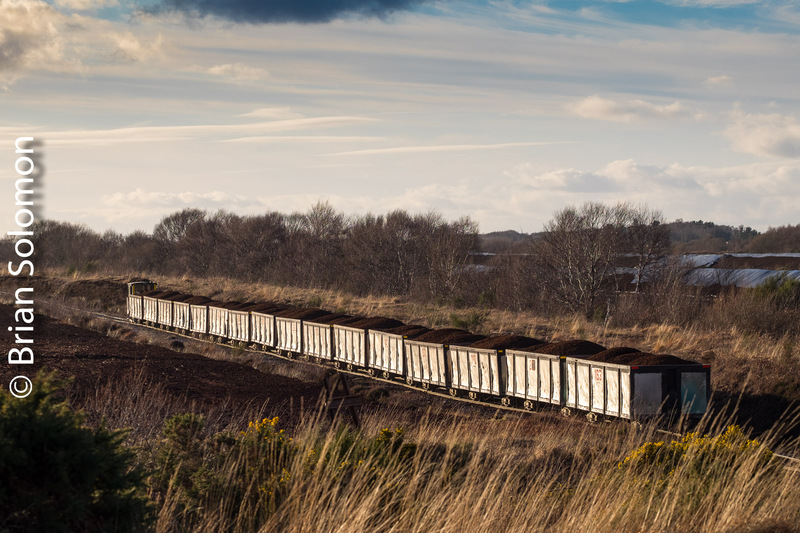 The ash train carries waste ash (left over from the burning of peat) for disposal back into the bog. Canon EOS 7D photo. Now, someone at Bord na Mona might read this and say, “Elusive ash train? Why that’s scheduled to run every day at 2 pm.” Or, perhaps, it is scheduled to run every third Saturday after the first full moon on months that don’t end in ‘R’. (But, none-the-less, scheduled). Irregardless, so far as I was concerned, photographing the ash train on the move was a real coup! In the last year, I’ve made a half dozen ventures to photograph Bord na Mona’s narrow gauge lines, this was the first time I’d seen an ash train on the move. Certainly, I’ve seen them before, just not rolling along out on the road. 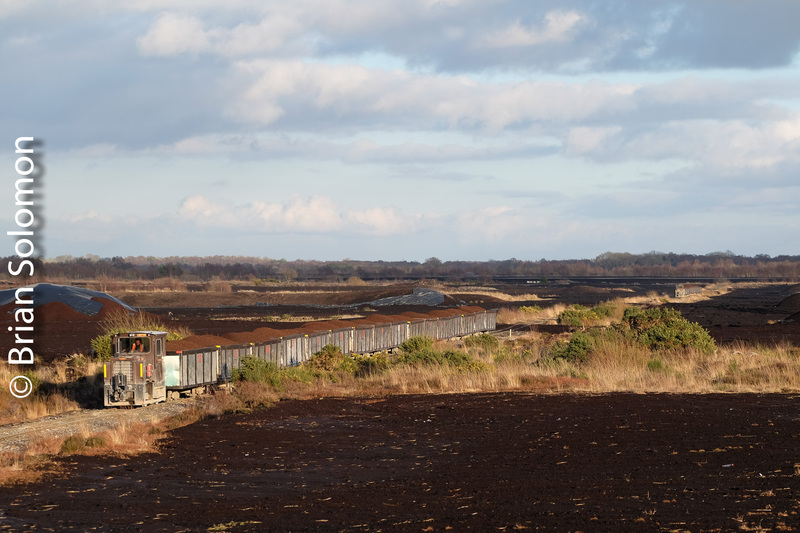 Trailing view of Bord na Mona’s ash train near Shannonbridge. Canon EOS 7D photo. The laden ash train roars along at a walking pace near Blackwater. Lumix LX3 photo, contrast modified in post processing. Yet, I’d call it elusive! It’s all a matter of perspective. More on elusive (or at least unusual trains) in future posts. Incidentally, unlike elusive trains, Tracking the Light regularly posts new material almost every day! So, to use an obsolete cliché, stay tuned! Bord na Mona ash train near Blackwater, August 2013. Canon EOS 7D photo. In a follow up to yesterday’s post, here’s a few more images from my early August adventure with Ireland’s Bord na Mona narrow gauge. I was working with three cameras: my Lumix LX3, my Canon EOS 7D digital SLR (single lens reflex) and my Canon EOS 3 35mm SLR. Since it will be a while before the slides are processed, all the images here are from the digital cameras. Under showery skies, a Bord na Mona train heads out across the bog for reloading. Canon EOS 7D. Loading of a Bord na Mona train. Canon EOS 7D. Road bridge over the Bord na Mona double track line near Shannonbridge, Co. Offaly. Canon EOS 7D photo. Peat hoppers and the harvested peat bog near Shannonbridge. Lumix LX3 photo. Maintenance train with sunny skies and weedy tracks. Lumix LX3 photo. Empty train growl along the bog. Despite their small size, Bord na Mona trains can be heard a long way before the arrive. Canon EOS 7D photo. Laden Bord na Mona train under a textured sky. Soon it will rain. Canon EOS 7D photo. I’ve found my visits to photograph the Bord na Mona railways exceptionally rewarding and productive and I look forward to more photography trips in coming months. 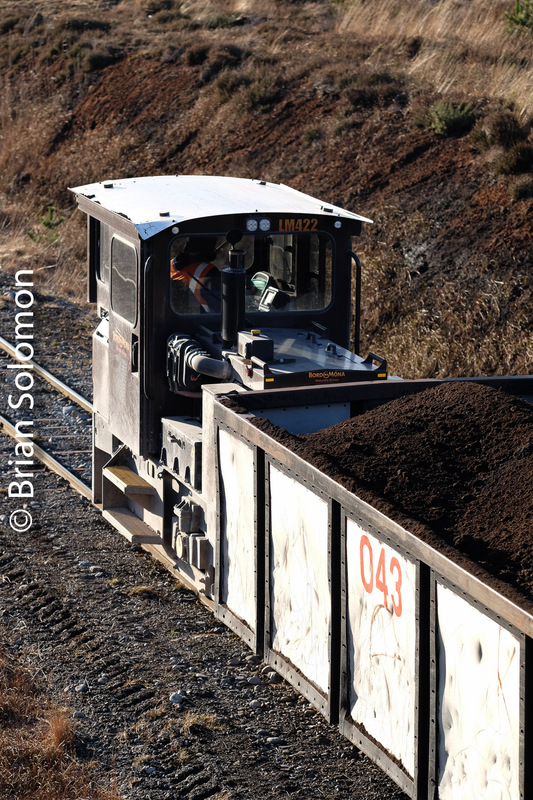 Ireland’s Bord na Móna (Peat Board) was the topic of my post, Gallery 8: Irish Bog Railways—Part 1 in November 2012. Yesterday, February 16 2013, I made another exploratory trip into the bog. Where previous investigations focused on operations at Edenderry, County Offaly, this trip was to the network that serves the Lough Ree Power Station along the River Shannon at Lanesborough, County Longford. 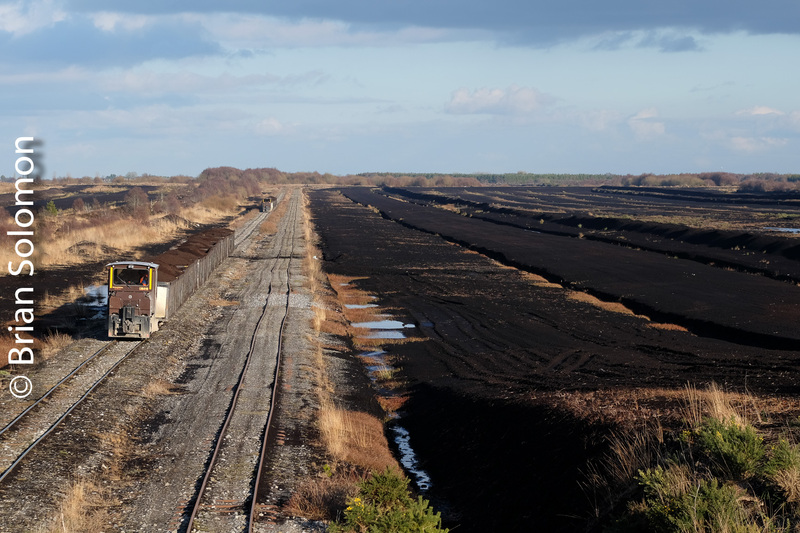 Among the peculiarities of Bord na Móna’s narrow gauge operations are its temporary sidings laid out on the bog for the purpose of loading trains. Until put in place, these tracks resemble those of an oversized model railway and are in fixed sections held together by steel sleepers (ties), and often stacked in piles awaiting installation. The bog itself is spongy and wet, thus ill suited to permanent infrastructure. Since temporary track is only used at very slow speed for short periods of time, niceties normally afforded railway lines, such as grading, leveling, and drainage, aren’t considered. Bord na Móna feeder for temporary track near Mt Dillon, County Longford; exposed with a Canon 7D with f2.8 200mm lens; ISO 400, f4.5 1/640th second. This telephoto view exaggerates the undulating quality of a roadside Bord na Mona spur used to access an area of bog ready for harvesting. This particular section of track may be left in place for years to tap short-lived harvesting spurs. This photographic adventure is among my works in progress; I plan to display more images of Bord na Móna in upcoming posts.